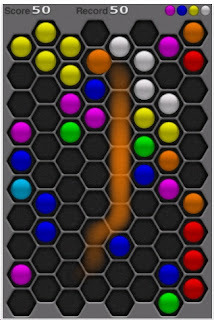 BeeCells Lite is a point scoring puzzle app. The object is to group the colors into clusters of 6 or more. When that happens, you score 6 points and then more colored tiles will appear randomly. The game ends when the board is filled. I thought that my top score of 424 was pretty good. Then I went on the Leaderboard and discovered that somebody scored 85,000. That's beyond phenomenal. I downloaded this game at night. And the first thing I did when I woke up was to play it. I did not check my email, the news or eat breakfast.